The relationship between science and theology has been a crisis for humanity since Darwin's publication of Origin of Species that affects the very core of scientific and Biblical truths with serious consequences. In this detailed and absorbing book Dr. Cherian provides astounding facts of science that were deciphered in the last 500 years, each of which is recorded in the Biblical Scriptures. Heeding back to the Biblical account of creation, Dr. Cherian takes the readers from the erroneous notion of the origin of the universe without a cause and abiogenesis as the source of life to the latest scientific discoveries that corroborate the Biblical evidence for divine creation of the universe, life and species that dispel Darwinian evolution. 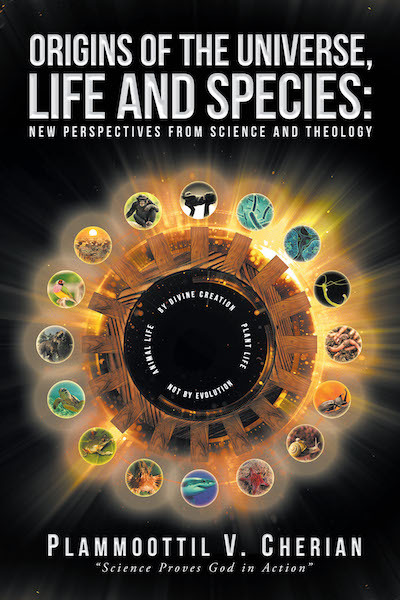 The Origins of the Universe, Life and Species sheds much light for a better understanding of the Scriptures that were hidden to many scientists, researchers and students to relate the scientific discoveries that reveal the Biblical truths for a better appreciation of the unknown God who reveals himself through the many scientists and their discoveries. Dr. Cherian, uses all branches of science from astronomy to zoology connecting the dots between science and theology that stretches from the highest of heavens (outer space) to the deepest of ocean floor revealing the unknown God to be the KNOWN GOD.